Get notice of new blog posts and behind-the-scenes info about events, training, and upcoming adventures. Looking for the Web site? Get a signed hardcover copy! Limited edition -- available while supplies last. 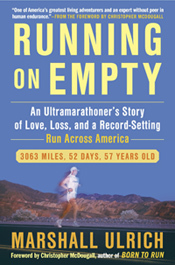 "Running on Empty" is also available in paperback wherever quality books are sold, including Amazon, Barnes & Noble, Books-a-Million, iTunes, and Indiebound. Chris McDougall, "Born to Run"
Frank McKinney, "Daredevil Real Estate Artist"
Jeff Galloway, "Running and Walking Until You're 100"
John Vonhof, "Fixing Your Feet"
Lisa Smith-Batchen, "Running Hope Through America"
Todd Jennings, "Into the Woods"
Copyright 2007-2018 by Marshall Ulrich.